Since WordPress is a blogging platform, a default installation of WordPress shows the most recent blog posts on the front page. But many users use WordPress as a Content Management System (CMS) for their website and want to have a static page, a number of pages, or a splash screen as the front page instead of a listing of their latest blog posts. It is very easy to configure WordPress to be used as a CMS for a website so you can have a number of static pages (the website) and the blog. In short, you have to create two WordPress pages in WordPress; one to be used as static front page and one which will be used to show the latest blog posts. 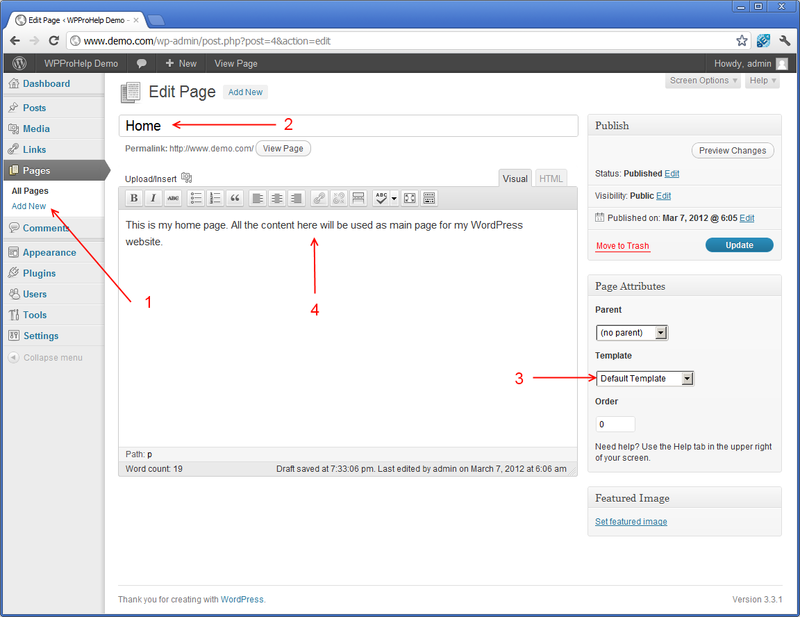 Then configure WordPress to use the newly created page as main page with just two mouse clicks. The whole procedure is explained in detail in an easy to follow step by step tutorial below. Login to your WordPress administrator portal, which is typically accessible via http://www.yourwebsite.com/wp-admin and navigate to the Pages > Add New node from the WordPress main menu. Title the first page to ‘Home’ or any other name that will be used for your new static front page. Note: Do not name the page home.php since it might create conflicts. If you already have a custom WordPress page template for your static front page, select it from the templates drop down menu. If you do not have such a template, use the default one. Add the content you would like to see within the content area of the home page and publish the page by clicking on the Publish button. Create another page and name it ‘Blog’ or any other name that will be used as a place-holder for showing the blog posts on your website. Note: For the blog posts place-holder page, DO NOT use any custom WordPress page template and DO NOT add content to the blog page. Any content in this page will be ignored and only the title will be used. 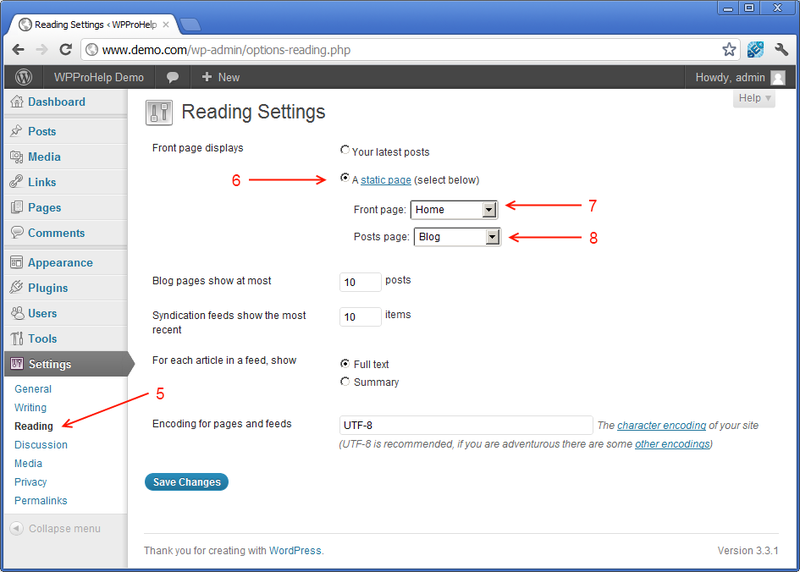 While logged in the WordPress administrator portal, navigate to the Settings > Reading node as highlighted in the screen shot below. Tick the option ‘A static page’ in the ‘Front page displays’ settings section. From the ‘Front Page’ drop down menu select the title of the static page you created to be used as a static front page. From the ‘Posts page’ drop down menu select the title of the page you created to be used as a content-holder for the blog posts. Note: You should enable the WordPress Permalinks to show the Page Title in the address instead of the default WordPress URLs. For more information on WordPress Permalinks read How to configure WordPress Permalinks. WP White Security.com Marketing Tip: Ideally the main static page should use the same colour scheme and similar layout to the blog. Even though the blog is a separate ‘module’ than the website, the more it blends in with the website (colours and theme) the easier and more professional looking it would be. Good article, but I cannot find an answer to this question: How do I change the template for the front page to be the same as the other static pages? Thanks. In that case it is very simple. You have configure the page you are using for the front page to use the same page template of the other pages. If you have problems or queries about this, feel free to drop me an email on john@wpwhitesecurity.com. All the best for the changes! I am trying to follow these instructions, and after I set the reading settings, my home page goes blank. No HTML is rendered. I am stuck on that. It seems that something is crashing, i.e. WordPress whitescreen of death. Drop us an email on support@wpwhitesecurity.com and we will have a look at it. Thank you for following our blog.